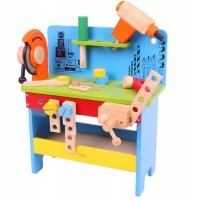 BigJigs’ workbench is a wonderful wooden toy which will make a fantastic present for children who love construction toys. The magnificent My Tool Bench will keep junior builders and carpenters busy for hours! All the parts of this brilliant workbench are made of wood and therefore safe for little hands. The set contains clamps, nuts, bolts and plenty of pieces of wood that can be used to make all sorts of interesting contraptions! 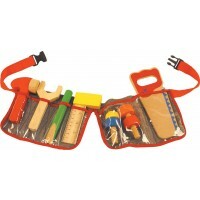 The screwdriver and spanner will help children improve their fine motor skills in their mini workshop. 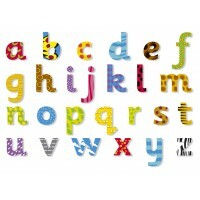 Children will spend many happy hours playing with this magnificent wooden toy which will also help with coordination, planning and problem solving skills. Simple home assembly required. When assembled, the workbench measures H750mm x W600mm.